Greg Grimes (Aquatic Environmental Services, Inc) was contracted to assist with preliminary planning of a lake for a client in Georgia. Greg said “by utilizing the lake design tools available through our partnership with The Mapping Network, we were able to see how large the lake would be, the max depth, average depth, size of the dam and also the watershed.” With the map the client was able to see potential challenges with a limited watershed. Information like this is critical when in the planning phase and now the landowner will scale back his lake plans based on the size of the watershed. Then next step will include engineering specs and the permitting process which will ultimately lead to the construction of the lake. 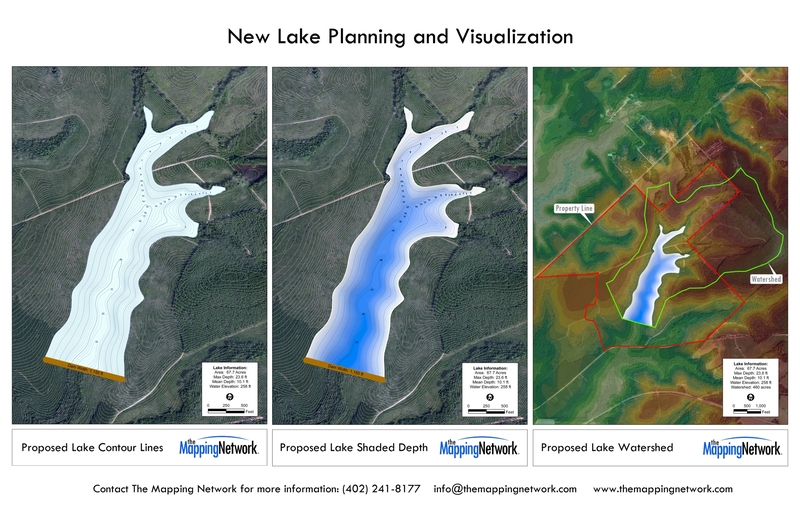 Proposed lake created by The Mapping Network using specifications provided by the landowner. This entry was posted in Lake Map and tagged 3D lake plan, 3D new lake, Bathymetric Map, Dredging, GPS Map, lake, lake construction, lake design, Lake Map, lake planning, Lake Survey, new lake, pond construction, pond design, Quality Lakes, Sediment, Sedimentation, south carolina lake map, Survey, The Mapping Network, Trophy Bass, Trophy Lake on September 4, 2013 by Moderator. This entry was posted in Lake Map and tagged 3D lake plan, 3D new lake, Bathymetric Map, Dredging, GPS Map, lake, lake construction, lake design, Lake Map, lake planning, Lake Survey, new lake, pond construction, pond design, Quality Lakes, Sediment, Sedimentation, south carolina lake map, Survey, The Mapping Network, Trophy Bass, Trophy Lake on April 19, 2013 by Moderator. This entry was posted in Lake Map and tagged 3D lake plan, 3D new lake, Bathymetric Map, Dredging, GPS Map, lake, lake construction, lake design, Lake Map, lake planning, Lake Survey, new lake, pond construction, pond design, Quality Lakes, Sediment, Sedimentation, south carolina lake map, Survey, The Mapping Network, Trophy Bass, Trophy Lake on September 4, 2012 by Moderator. This entry was posted in Lake Map and tagged 3D lake plan, 3D new lake, Bathymetric Map, Dredging, GPS Map, lake, lake construction, lake design, Lake Map, lake planning, Lake Survey, new lake, pond construction, pond design, Quality Lakes, Sediment, Sedimentation, south carolina lake map, Survey, The Mapping Network, Trophy Bass, Trophy Lake on August 21, 2012 by Moderator.